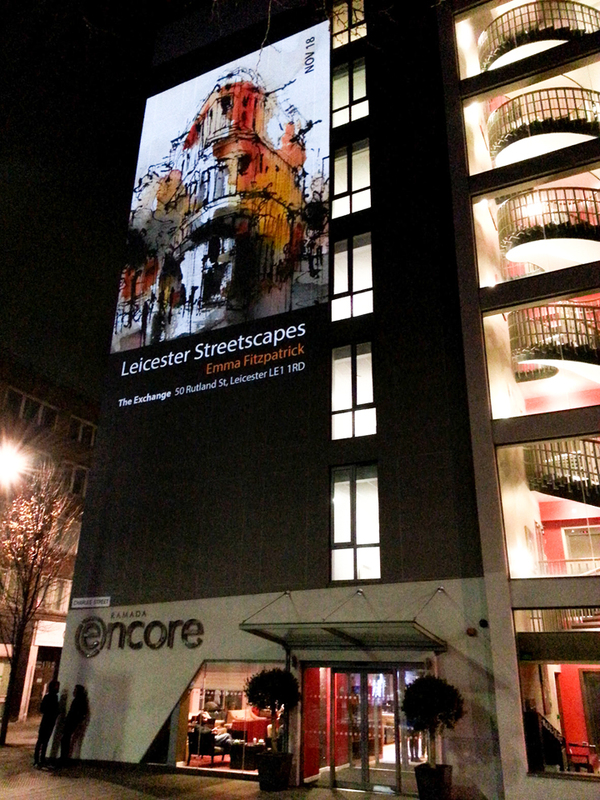 A new series of urban paintings of Leicester by Emma Fitzpatrick are on show in the cultural quarter of Leicester up to Christmas and the end of this year. Emma Fitzpatrick's lively paintings in Indian ink, watercolour and pastel bring to life the character of iconic city buildings. 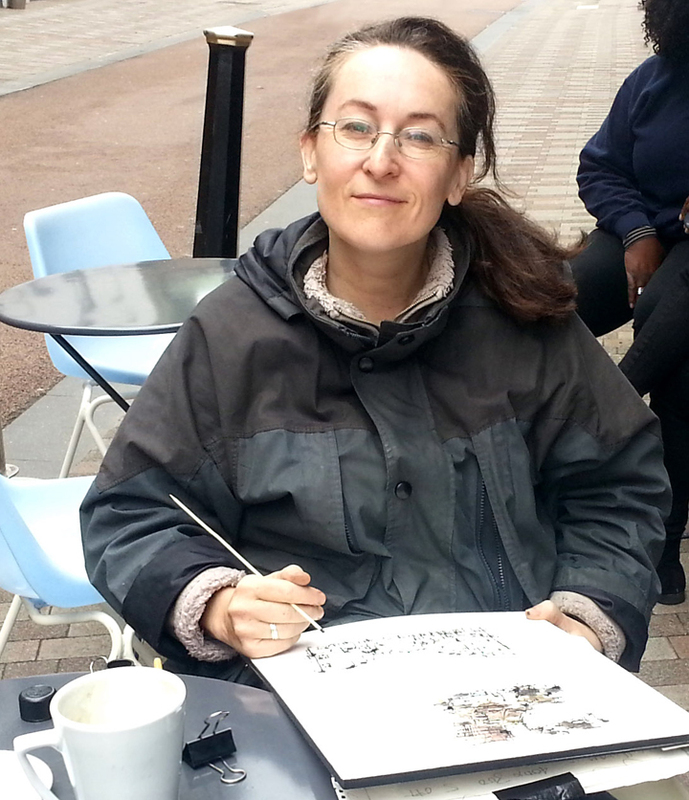 Drawing on location in the street, Emma moves between bars, cafes, banks, town halls and cityscapes with her watercolour equipment. 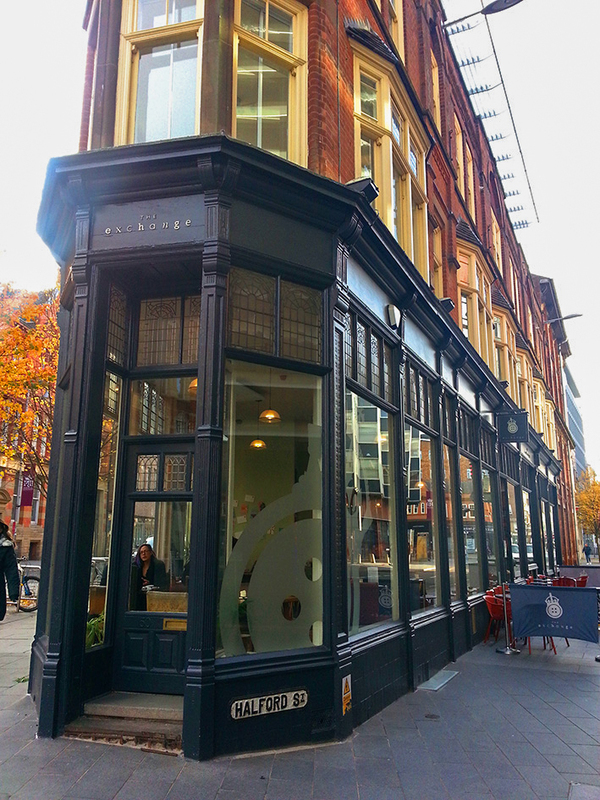 Large prints of her sketches decorate walls inside The Exchange Bar at 31 Rutland Street in Leicester. "I alter the giclee prints so they vary from my drawings in terms of scale, or else they are cropped," says Emma. 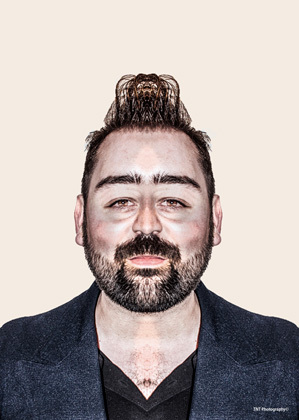 "It's interesting that when my works are enlarged they become very different from the original sketches." 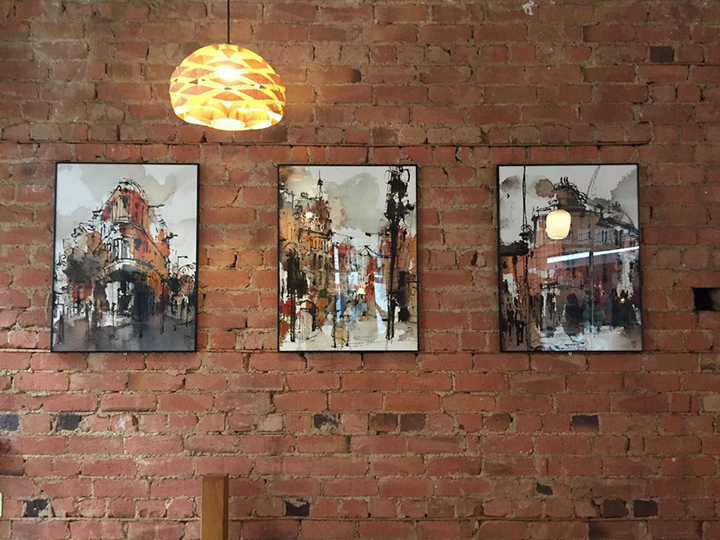 "I have three Leicester streetscapes in The Exchange Bar - they are enlarged giclée prints from my original watercolour and ink paintings," says Emma. The series of Emma Fitzpatrick's original streetscape paintings are currently on show at the independent Cank Street Gallery, 44-46 Cank Street Leicester. "These paintings shows Emma's love of the medium," says Dayle Flude, owner of The Cank Street Gallery. 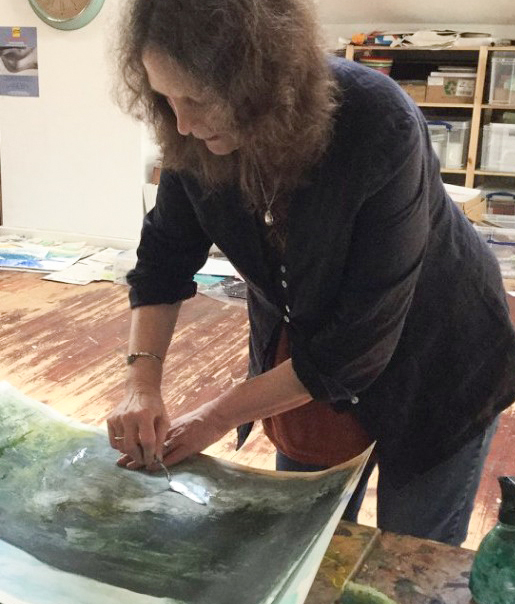 "She uses watercolour washes which blend with free flowing ink; pastel smudges with charcoal. A fleeting moment, the passing shopper, the scudding clouds - the effect is engaging and exuberant". Emma Fitzpatrick's paintings of buildings and streets in Leicester will continue at The Cank Street Gallery until the end of the year. 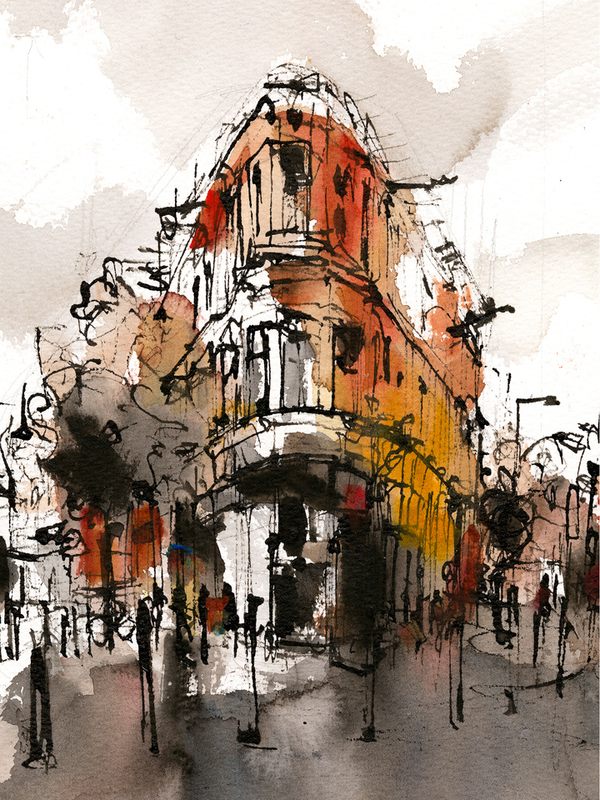 In 2016 As Secretary and President of Leicester Sketch Club, Emma Fitzpatrick initiated a series of meet-and-sketch opportunities for members and a running programme of talks, demonstrations and meetings. Leicester Sketch Club won '2016 Art Club of the Year' from 50 entries throughout the UK, hosted by The Artist and Leisure Painter magazines. Today, Emma continues to join LSC meetings to sketch at the Cosy Club, Life Drawing events. 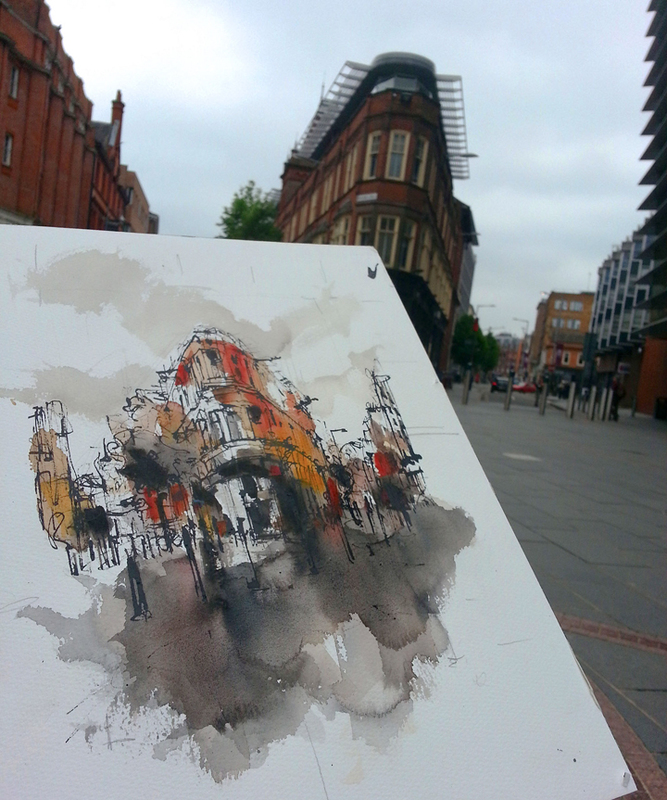 Emma Fitzpatrick was inspired to work on a series of streetscapes after joining a drawing day with the Urban Sketchers group in Birmingham. She won a 'People's Choice' award on the Jackson's art supplies blog for her sketch of the Café on Granby Street, Leicester in 2017. Determined to set up opportunities for people in Leicester to meet and sketch, launched a ‘Let’s Draw Leicester’ day in September 2017. 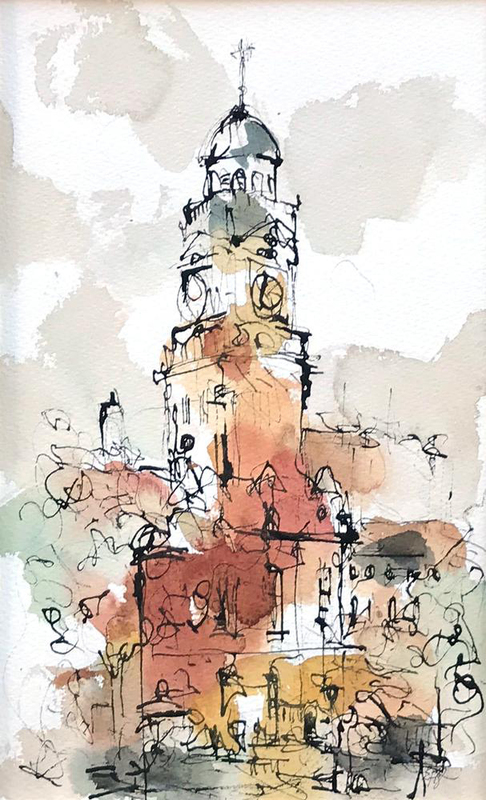 Emma Fitzpatrick organises the unofficial 'Urban Sketchers Leicester' with Austin Orwin, which advertises the next meeting on Facebook, encouraging people to come and draw for a day and explore a location with sketchbook in hand. Emma was invited to tutor workshops over a weekend as part of the Urban Sketching Summer School in Riga in August 2017. Urban sketching is quickly becoming a global phenomenon and Emma recommends tapping into grass root level by visiting w.urbansketchers.org which is the website that the Leicester Urban Sketchers group follows. "It was interesting to find a few links to Leicester when I was in Riga," says Emma. "It really does feel like one big club that you can tap into. For instance, I joined the Dublin and the Paris Sketchers when visiting those cities and all just welcome you in straight away." 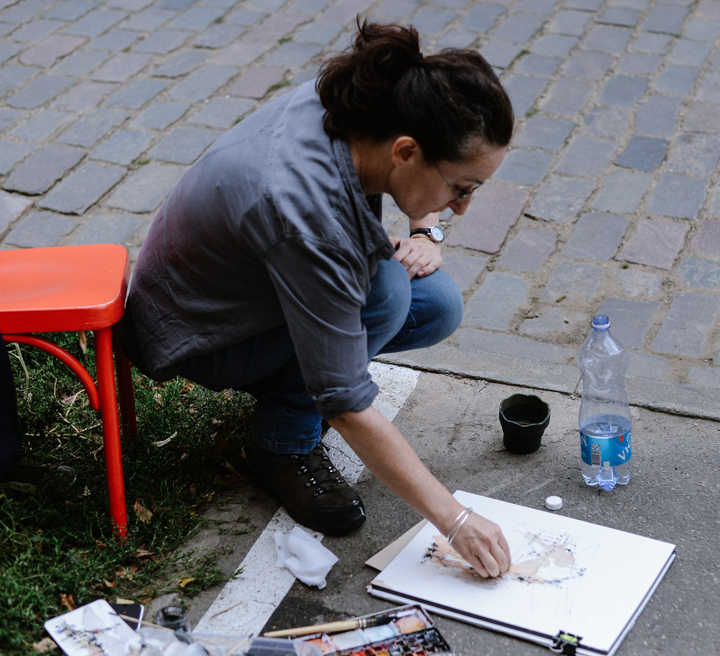 Urban Sketching is an activity that everyone can benefit from - even if you're a complete beginner to drawing. It is about developing creative skills within an encouraging group, finding time for yourself to be still, observe your surroundings and socialise with new people."